February 11th 2011. The temperatures are tantalisingly near that crucial 10 degrees and I have managed to see bees flying on a few days. What a relief. I thought I heard bees in the brood box one day last month and then read that for neurotics like me a secondhand stethoscope from ebay might be a great comfort. What a great idea. I must investigate. I’ll try and take a photo to-day if it gets warm enough. The photos shows the woodpecker protection and mouseguard still in place. And my mentor, Paul, has given me an idea of how to get a second hive up and running. getting excited about this beekeeping year. 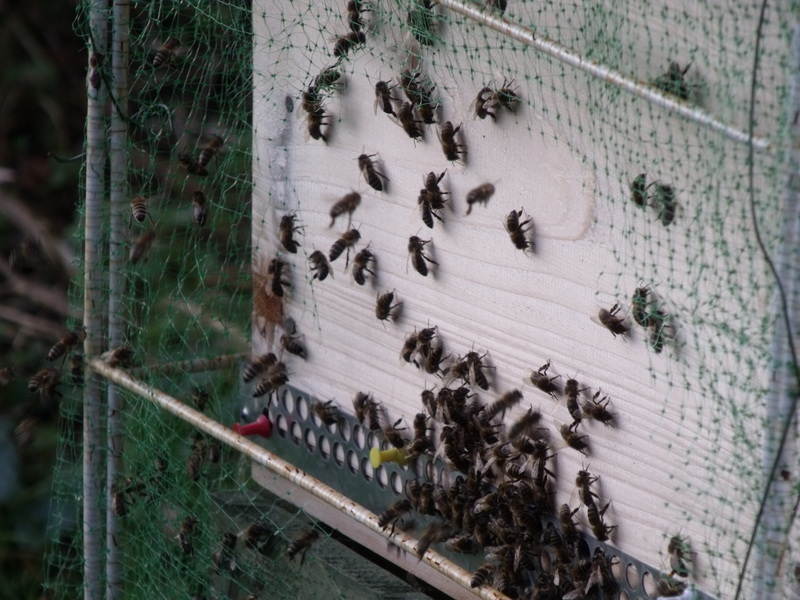 Lastly, my beginner’s course starts on 7th march at Wendover (Mid bucks Beekeeping Association). I am also an associate member at Wycombe where my mentor is based and can recommend both associations highly. An update on the last few weeks as I’ve not been good at completing it..
My mentor asked me to check the super he had lent to me and assuming there are no eggs or larvae in it, to swap it to the bottom. Unfortunately, finding a warm enough day was a problem and when one arrived, barely warm enough, I was surprised by the number of bees on both super and brood box and did not manage successfully. I’m only mentioning this failure because any good beginners diary should not present a rosy picture and only pick out the good. I even got stung through my gloves – admittedly thin ones. My second attempt also had a hiccup – as I moved the brood body, the floor was propolised to it and mid movement clattered away to the shock of a lot of bees and their hesitant owner. Still, I performed the change but without further checks on the super – the poor things had enough disruption. The earth movement and digger machines have probably also been a trial to them all. 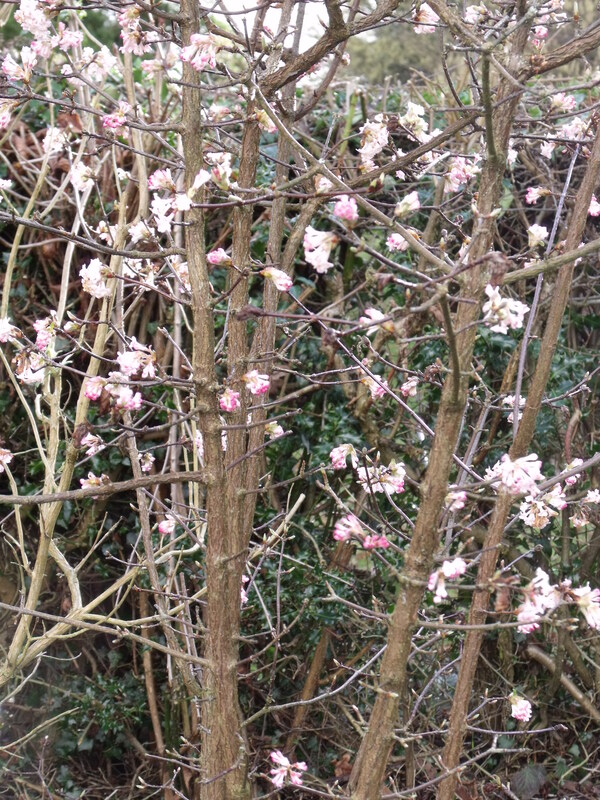 To-day, the 19th March, it was warmer still – I believe more like 13 degrees. It was certainly 11 degrees by about 9 am. This time a good proportion of bees had bright yellow pollen. They were bringing it in until at least 4 pm. My pocket pollen guide suggests this could be hazel or possibly laurel. I’ve got a couple of photos. 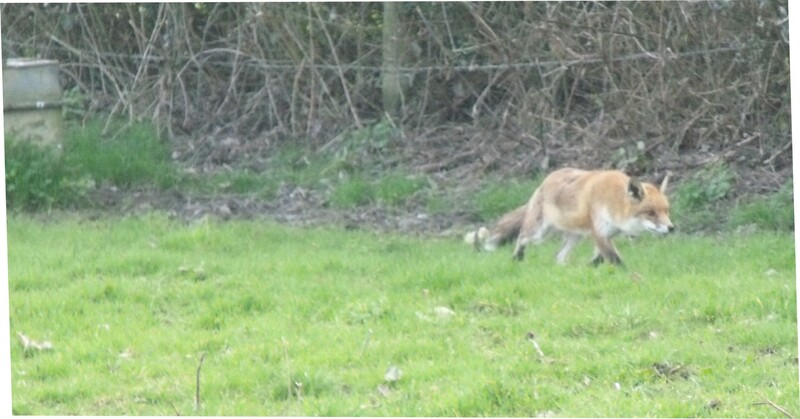 Oh and also caught a fox at my last visit – quite unabashed by my presence just across the hedge from him. 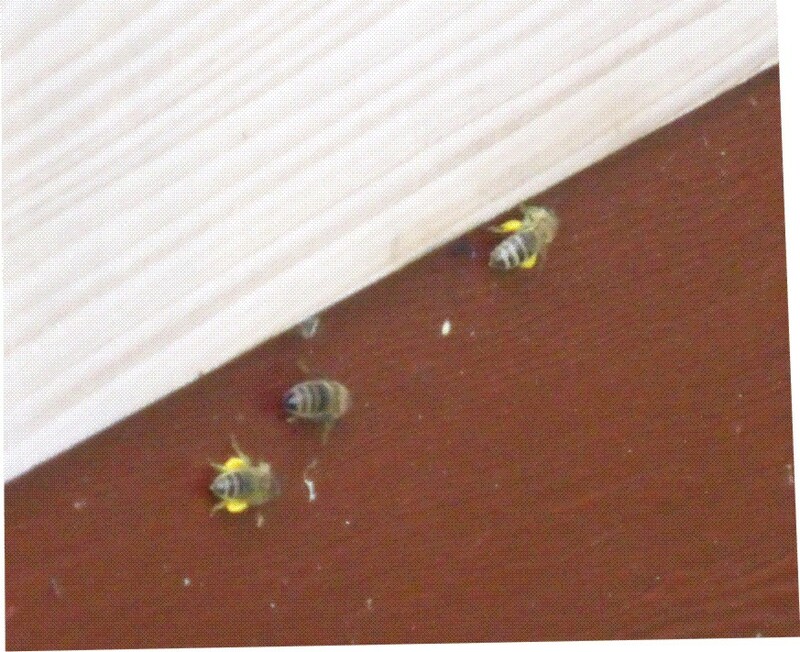 My bees seemed to have started to find bright orange pollen from a tree which could be a small plum or a cherry (it doesn’t fully fit either criteria). As I tried to photograph them I saw a much larger insect – like a wasp but so large that my mind darted back to hearing the panic stories about the Asian Hornet. 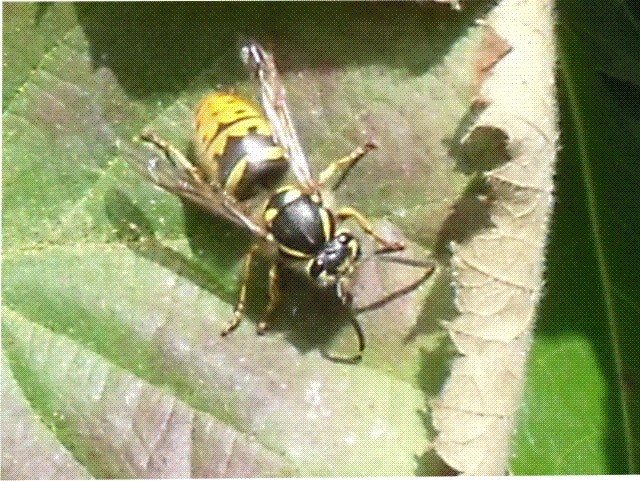 However, the Beekeeping Forum members have confirmed it was just a queen. I know there has been conflicting comments but how I wish I had taken the opportunity to prevent her laying or even living.